the relatively rapid expansion and diversification of an evolving group of organisms as they adapt to new ecological niches. Adaptive radiation is the process by which one species evolves into two or more species. This occurs as a result of different populations becoming reproductively isolated from each other, usually by adapting to different environments. any animal of the primate suborder Anthropoidea. Monkeys, apes, and humans are the living anthropoids. tree-living; referring to animals that are adapted to life in the trees. Arboreal animals spend most of their time scampering around in trees rather than on the ground, in the air, or water. See semi-terrestrial and terrestrial. eating only meat. Animals that have this sort of diet are carnivores. See herbivorous and omnivorous. the most recent geological era, dating from about 65.5 million years ago to the present. It is the era in which the mammals flourished. It began as the last dinosaurs became extinct, at the end of the Mesozoic Era. Most of the placental mammals and all of the primates evolved during the Cenozoic. a date that places an event in its chronological position with reference to a universal time scale such as a calendar. Such dates usually are given in terms of the number of years before or after a calendar starting point. For instance, 1950 B.C. was 1950 years before the beginning date of the Gregorian calendar, which is commonly used today. See relative date. being awake and active during the daylight hours but sleeping during the nighttime. specific micro-habitats in nature to which populations or organisms adapt. They are usually seen in terms of being food getting opportunities in the environment. the second geological epoch of the Cenozoic Era. The Eocene spanned the time approximately 55.8-33.9 million years ago. a cell that has a true nucleus and that divides by mitosis. Complex single celled creatures such as protozoa as well as all multicelled plants and animals are primarily eukaryotes. With the exception of red blood cells, human cells are eukaryotic. See prokaryotic cell. the combined land mass of Europe and Asia. the infraclass of therian mammal species in which females produce a placenta to connect the fetus to the uterus. This enables nutrients and oxygen to get to the fetus and provides a means of eliminating waste products. As a result, eutherian mammals can carry their young within the uterus until late in fetal development. This has a selective advantage because it results in decreased infant mortality. Eutherian mammals are also called placental mammals. Included in this infraclass are dogs, cats, bears, whales, monkeys, humans, etc. genetic change in a population of organisms that occurs over time. The term is also frequently used to refer to the appearance of a new species. More specifically, it is change in the frequencies of alleles in a population's gene pool from one generation to the next. terms of Latin origin that are commonly used in the sciences to refer to the plants (flora) and animals (fauna) in an environment. the hole at the base of a skull through which the spinal cord passes. Literally, foramen magnum means a "large hole or opening" in Latin. The position of the foramen magnum is a strong indicator of the angle of the spinal column to the head and subsequently whether the body is habitually horizontal (like a horse) or vertical (like a monkey). a dramatic reduction in genetic diversity of a population or species resulting from an ecological crisis that wipes out most members. The limited genetic diversity of the few survivors is the pool from which all future generations are based. a group of closely related species. In the Linnaean classification system, genus is the category immediately above species. a long depression in Southwest Asia and East Africa caused by the movement of tectonic plates, largely beginning during the Oligocene Epoch. In Africa, it extends from Ethiopia southwest 1200 miles through the lake regions. Many of the early hominid discovery sites are in this valley system. the most commonly used calendar system in the world today. It is based on the older Julian calendar of the late Roman Empire but more accurately corresponds to the solar year of 365.2422 days. The Julian calendar year is 365.25 days. This is inaccurate by approximately 11 minutes a year. The result is that the Julian calendar is out of sink by one day every 131 years. The Gregorian calendar fixed this problem by changing the rules for leap years. In the Julian system, a day is added to the end of February every 4 years. In the Gregorian system a year is a leap year if it is divisible by 4 unless it is divisible by 100 but not by 400. This eliminates leap years periodically in order to keep the calendar more synchronized with the solar year. The Gregorian calendar was named after Pope Gregory XIII who officially approved it in 1582 A.D.
eating only vegetable foods. Animals that have this sort of diet are herbivores or vegetarians. See carnivorous and omnivorous. any species of the primate family Hominidae, which only includes humans today. any species of the primate superfamily Hominoidea. All hominids and apes are hominoids. animals in the mammalian order Insectivora. They were named for their adaptation to eating insects. The insectivores were among the earliest of the placental mammals to evolve. an animal that lacks an internal skeleton. All animals other than fish, amphibians, reptiles, birds, and mammals are invertebrates. Approximately 95% of all animals are invertebrates. any of two or more forms of an element that differ in terms of atomic mass but have the same atomic number--for example, carbon-12, carbon-13, and carbon-14 are all isotopes of carbon. an animal in the class Mammalia. a class of warm blooded, usually hairy animals, that feed their young with milk secreted by the mammary glands of females. The Mammalia include monotremes, marsupials, primates, cats, dogs, bears, hoofed animals, rodents, bats, seals, dolphins, whales, and several other groups of animals. the geological era immediately preceding the Cenozoic Era and dating approximately 251-65.5 million years ago. The Mesozoic was the era in which the dinosaurs flourished and the first mammals and birds evolved. the infraclass of therian mammal species in which females bear their young in an immature condition (while still in the early fetal stage) and then permit their further infant development in an abdominal pouch covering their mammary glands. Compared to the delayed births of placental mammals, this is inefficient in keeping young infants alive. Metatherian mammals are also called marsupials. Included in this infraclass are kangaroos, koalas, opossums, etc. the fourth geological epoch of the Cenozoic Era. The Miocene occurred approximately 23-5.3 million years ago. small rod-like structures in the cytoplasm of a cell that produce fuel for the cell in the form of adenosine triphosphate (ATP). A small amount of DNA is located in mitochondria. This DNA is inherited only from mothers and is distinct from DNA that makes up the chromosomes. the comparatively large grinding teeth at the back of the mouth in mammals. 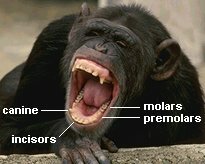 In hominids and all other anthropoids, there are normally 3 molars in each quadrant of the mouth. an evolutionary mechanism that occurs when some individuals of a population are better able to adapt to their environment and, subsequently, produce more offspring. Nature, in effect, selects which members of a population are fit to survive long enough to reproduce. Differential productive success between individuals is the key. Those who produce more offspring have a greater influence on the gene frequencies of the next generation. This mechanism of evolutionary change was first articulated by Charles Darwin. the third geological epoch of the Cenozoic Era. The Oligocene occurred approximately 33.9-23 million years ago. the ability to live by eating both meat and vegetable foods. See carnivorous and herbivorous. a Linnaean classification category above the level of species and genus and below class. Each order can consist of many species and genera. The first geological epoch of the Cenozoic Era. The Paleocene occurred approximately 65.5-55.8 million years ago. a cell that lacks a true nucleus and divides by simple fission rather than mitosis. Bacteria and blue-green algae are prokaryotes. See eukaryotic cell. the suborder of primates (Prosimii ) that includes all of the lemurs, lorises, and related "primitive" primates. the subclass of mammal species in which females lay eggs like birds and reptiles. However, they feed their newborn with mammary gland secretions like all other mammals. The Prototheria are also referred to as monotremes, which literally means that they have only one opening for excretion and reproduction. Included in this subclass are the platypus and echidna. a four-footed form of locomotion. Most mammals are quadrupeds. The hominids are exceptions, being bipeds. referring to techniques for chronometric dating based on known half-lives of particular isotopes or the rate of other cumulative changes in atoms resulting from radioactivity. Examples include electron spin resonance, fission track, potassium-argon, radiocarbon, and thermoluminescence dating. a date that gives the time of an event only with reference to another event that is not worldwide in scale. It only indicates that one event occurred earlier or later than another. For instance, the observation that strata 2 is younger than strata 1 beneath it in a geological deposit does not provide information about how many years ago strata 2 was laid down. It only indicates its age relative to strata 1. In addition to the use of stratigraphy, relative dating methods include biostratigraphy and fluorine analysis dating. See chronometric date. seasonally dry tropical or subtropical grassy plains with scattered trees. Savannas are usually the habitat of larger herbivores and their predators. The first hominids apparently evolved on and near African savannas. rock formed from sediments usually eroded from older rock or inorganic remains of organisms (e.g., shells and skeletons). Examples: sandstone, shale, and limestone. the study of the earth's crustal structures, such as continental plates, and the forces that cause them to change shape and move relative to each other. the subclass of mammal species that include the marsupials and placental mammals. the subphylum of chordates that includes the animals that possess a spinal chord protected by a segmented vertebral column of cartilage and/or bone. members of the animal subphylum Vertebrata. Copyright � 1999-2013 by Dennis O'Neil. All rights reserved.